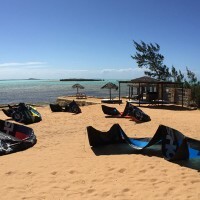 Kitesurf Madagascar offers kitesurfing lessons from discovery to advanced levels. Learn to kitesurf or improve your style with our customized courses of 3, 6, 9 and 12 hours in french, english, spanish, italian. We offer private lessons or in groups of 2 people in order to adapt to the progression of each of our students. Our teaching system is personalized according to your aims and objectives and our IKO instructors will follow you step by step through all the steps of becoming an independent rider. 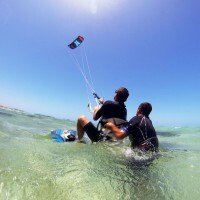 Discover while having fun how kitesurfing is accessible to all and easy to learn. We invite you to check below our kitesurfing learning programs for all details regarding learning objectives and costs. Time necessary to becoming an independent rider will depend on your motivation and ability. For security reasons we rent equipment only to people who can stay upwind without any problem accepting our rates for damage to the equipment. Be an independent rider and be able to stay up wind without any trouble. Show sufficient knowledge of kite control and security to one of our instructors. The equipment must be returned in the same condition it was rented. The rented equipment its to be used only on the Emerald Sea. We reserve the right to cancel the lease if we believe that your safety is at risk or you threaten other users. Accept and sign the liability form, available from our instructors. All equipment is provided on site: kite, bar, board, wetsuit, shoes, safety vests, harnesses and helmets. 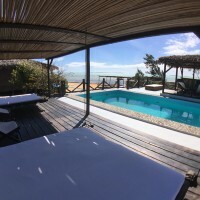 Our Kiteboarding school is located in the installation of this splendid ecolodge who has all the necessary comfort to relax and enjoy in front of the emerald sea and its incomparable turquoise blue water. The view is amazing, the peace is majestic ! a regenerating isolation far from the exhausting stress of the cities, a place that with no doubt will remain in your memory. On this exceptional site , they have created a charming unit and offer excellent holidays to nature lovers ! This simplicity of this ecolodge obviously does not exclude your comfort: 220v electricity and European toilet style , free Wi-Fi , a nice swimming pool, and its gourmet cuisine , made with fresh ingredients all days, a charming and dedicated staff are at your disposal. The hotel has 6 bungalows Simple but cozy, all the bungalows are constructed of wood and offer all the comfort for a pleasant and carefree vacation. Each bungalow has a queen–size and a single bed, electricity, a private bathroom with hot water, a terrace overlooking the sea and large storage space.